« Doing History: How Do We Know Queen Boadicea/Boudicca Existed? Gyges … the ancestor of Croesus was a shepherd when he was young, in the service of [Kandaules] king of Lydia. Once upon a time there was a storm and an earthquake so violent that the ground split open near the place where Gyges was watching his flocks. Gyges was amazed at the sight and finally went down into the cleft. The story tells of many wonderful things which he saw there …. Among these wonderful things was a brazen horse which was hollow and had doors. In it was nothing but a corpse, of heroic size, and on one of its fingers a gold ring. Gyges took the ring and came out again. He then procured his appointment as one of the messengers to the king and went up to Sardis to seek his fortune. After reaching Sardis an adventure with the ring brought him to the notice of Kandaules (the king). At first, he was highly favored but later the king, who was cruel and whimsical, became suspicious of Gyges and set him at several tasks certain, as he supposed, to compass his destruction. Gyges, however, performed them all successfully with the aid of his ring, was reinstated in favor and given great estates …. Gyges was now not only rich and powerful but also admired and feared for his beauty, strength and address, and for his versatility and superhuman knowledge of what was going on. The king who, like everyone else, knew nothing of his ring…, found Gyges invaluable, gave him the post of chief adviser and consulted him on all occasions. There was one thing, however, which Kandaules had always kept jealously guarded, because it was the principal source, the real secret, of his power. This was his wife. She was …. exceedingly beautiful. But what made her indispensable to Kandaules was the fact that she was also very wise and powerful, being a mighty sorceress. Gyges gazed upon her. She was more lovely even than Kandaules had described her,and Gyges fell in love with her then and there. Finally, having turned his ring around to make himself invisible, Gyges left the room. The queen, however, [possessed a dragon-stone….. As he was going out [she] had seen Gyges [in spite of his magic ring]. But she made no sign. She knew that the situation was due to Kandaules and swore to be avenged. At last, when the queen saw that Gyges was entirely in her power, and being also in love with him herself, she laid her plans and sent for him. When he arrived, she told him [that she had seen him look on her as she undressed] that now Gyges must slay Kandaules or else die himself. Whatever the feelings of Gyges may have been, his situation, despite his magic ring, was even more desperate than in Herodotos. He had a sorceress to deal with and was committed to her by ties which he could not break, even if he had so desired. Such is the tale of Gyges, ancestor of Croesus …..
Herodotus [I, 7-16] spoke of Gyges being persuaded by King Candaules to secretly look at the naked beauty of his wife, Nysia. Nysia did see Gyges, however, and knew he had been compelled by her husband. The next day she ordered Gyges to kill Candaules (in return for which Nysia would marry him and allow him to become the new king) or be immediately executed for his crime of secretly looking at her nakedness. Nicolaus of Damascus told of how Gyges attempted to seduce the king’s bride-to-be, but she resisted and told the king. In fear of his life Gyges struck first and assassinated the king and replaced him on the throne. Justin [I, 7] wrote another version of the king obliging Gyges to spy on his wife in their bedroom. The wife then demanded that Gyges kill her husband in return for marrying her and becoming the new king. Plato [Republic II, 14] told the story of Gyges discovering the magic ring in the cave, learning that he could make himself invisible at will, and traveling to the court of King Candaules to find success for himself. There he seduced the queen and with her help he slew him and took possession of the throne. Photius informs us that the wife’s name was Nysia, the name being suppressed by Herodotus because a namesake had been the cause of his friend’s suicide, thus causing Herodotus to hate the name. Photius also says Nysia had “double pupils” making her “extremely sharp of sight” and possessed the dragon stone that enabled her to see Gyges even though he was invisible to all others. Plutarch [Greek Questions, XLV] speaks of Gyges with friends engaged in war against Candaules and eventually defeating and killing him and taking over the kingdom. So we have multiple ancient sources for the rise of king Gyges but they are late, often inconsistent with one another, and bedecked with what we would call fairy tale motifs. (Some of these accounts have been thought to have derived from a now lost common source.) Surely we cannot imagine a historical Gyges from the above. But Gyges did exist, and he was indeed the king of Lydia. Gyges, of whom Archilochus the Parian, who lived about the same time, made mention in a poem written in iambic trimeter verse. I don’t care for multimillioned Gyges…. (attributed to Plutarch in Paths to the Ancient Past but I think this is a mistake; the line is found in Aristotle’s Rhetoric…. the floruit of Archilochus as 682 B.C., and this would agree fairly well with the dates suggested by Herodotus’ account. Mimnermus, who composed elegiac verses about the battle between the Smyrnaeans and the Lydians under Gyges, says in the preface that the elder Muses are daughters of Uranus, and that there are other and younger Muses, children of Zeus. Tantalising. Not as strong as a rock, but enough glimmers of contemporary witnesses for us to think that there probably really was a historical Gyges behind the later legends and outright “fairy tales”. In Jones’ words, the evidence allows us to “infer” Gyges’ existence. The whole matter, however, was removed from the realm of inference in 1878 when Hormuzd Rassam, the friend and successor of Layard in charge of the excavations at Nineveh, found a great cuneiform cylinder which recorded the events of the first half of the reign of the great Assyrian king, Ashurbanipal (668-627 b.c.). An Assyrian royal inscription tells how the Lydian king Gyges received dreams from the Assyrian god Ashur. The dreams told him that when he submitted to Ashurbanipal he would conquer his foes. After Gyges sent his ambassadors to accept Assyrian vassalage he defeated his Cimmerian enemies. Translation in Jones, pp. 83-84.
he conveyed by the hands of his messenger and repeated to me. who feared not my fathers nor yet grasped my royal feet, he overcame. caused to be sent to me along with a suitable present. may they carry off his carcasse.” Just as i prayed to Ashur, it happened. his corpse was given to his enemies, and they carried off his carcasse. attacked and overcame his whole country. His successor, his son, sat upon his throne. laid hold of my kingly feet, saying: “You are a king whom the god recognizes. You cursed my father and evil befell him. That is confirmation of the existence of a historical Gyges, king of Lydia. Unfortunately that primary source raises new questions because it would assign a different date to that Gyges from the one the fifth century Herodotus indicated. The Assyrian king who is the subject of the cylinder began his reign in 668 BCE, ten years after Herodotus would lead us to think Gyges died. But Herodotus also informs us that Gyges made an alliance with Pharaoh Psammetichus who in fact began his rule in 664 BCE. These details and other literary accounts of the later history of Lydia lead us to conclude that Herodotus did not have a precise knowledge of the dates of events two centuries before his time. But we have other reasons for thinking that Herodotus is not always “wikipedia accurate” in his historical narratives anyway. 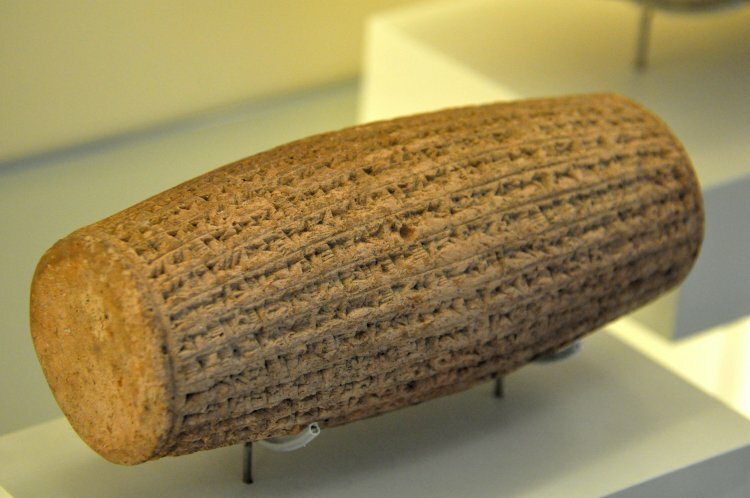 The point is that historicity of persons is determined most securely by primary sources, physical objects that date to the actual time of the person as in the case of the Ashurbanipal cylinder. However, even when we don’t have that sort of decisive primary evidence we can infer historicity where we have knowledge of an independent source that is contemporary with the person in question. Such information can never be as final as primary sources but it does allow us to have a reasonable level of confidence in the historicity of the person, always tinged with a readiness to revise one’s opinion in the light of new evidence. In this post we have seen a different case, varying accounts of a figure who easily falls into what we would naturally view as a fairy tale: a magic ring bestowing the power to become invisible; a sorceress queen; a cunning hero outwitting a foolish, powerful king. Yet in such an unlikely case we find that sound historical methods that seek to verify accounts by means of independent information traceable to the time contemporary with the persons or events can lead us to discover a genuine “historical core”. Jones, T. B. (1967). 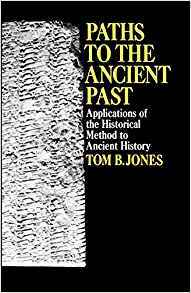 Paths to the Ancient Past: Applications of the Historical Method to Ancient History. Free Press. Posted on 2018-05-08 13:40:26 GMT+0000 by Neil Godfrey. This entry was posted in Historical Methods and tagged Ancient historians, Historical Method. Bookmark the permalink. Fascinating stuff. I’d never heard of “Paths to the Ancient Past” until now. I will be picking up a copy.